April 23, 2012 in category Misc Silliness tags Advertising characters, biscuits, Cool dudes, Packaging design, Skateboard Characters and 2 comments. BOOYA!!!! Now that’s a spicey meat-a-ball! 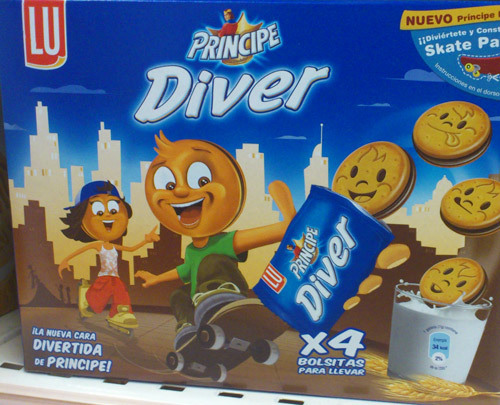 Principe Diver really takes the biscuit! Not only do we have a skateboard but also ROLLERBLADES! And there is a half pipe visible in the background too. Theres another skateboard up in the top right corner, giving a grand total of THREE SKATEBOARDS. Additional points for the backwards baseball cap and baggy urban trousers on the girl. A bit too smiley. If he had just one eyebrow crooked it would elevate this piece from bland to edgy. The art on this brilliant. The bold blue base/skyline keeps in line with the Principe logo and brand while the rest is biscuit coloured. I like the composition, to the left we have the excitement and to the right we have the visual facts by seeing the product in action. It’s very clever the way they incorporated the glass of milk and wheat into the image while at the same time showing the product being dunked into the milk. The only goof I can see is his hand but it’s understandable how tricky it is to tie all together. Top marks for this. The only thing missing from this would be sunglasses. It has everything else. Principe is Choco Prince? What does the text down in the bottom left say?